I should just say forget the review, just go out and buy this crazy, magnificent CD. It would save us all a lot of time. 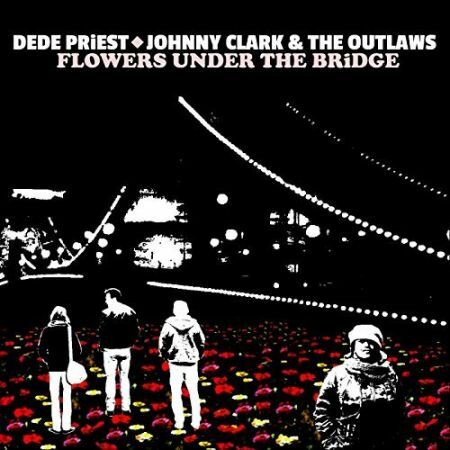 Dede Priest along with Johnny Clark(Hans Klerken) & The Outlaws are just that crazy good. If you are a sucker for energy driven rock, blues, indie rock, a dash of funk and country fronted by a Texan woman who has a mesmerizing and haunting voice with hints of Eartha Kitt, Janis Joplin and Elkie Brooks from her Vinegar Joe days among others, have I got a band for you. If that’s not enough for you, she tackles most of the lead guitar chores expertly and plays a mean violin to boot. Johnny Clark and band are a rockin’ three piece from The Netherlands who have a firm grip on rock and blues. This is a match truly made in music heaven. The songs are band originals, save one cover song. Their songs reek of originality in both lyrics and musical attack. OK, you need a review to seal the deal. Here goes, hold on tight for this beautifully crazy noise. Dede’s commanding lead guitar attack leads the charge on the snappy “You Are Love”, as her brilliant pipes rattle off the inspired lyrics. Sugarcane Harris-like violin cuts through the air over a wah-wah rhythm guitar groove on “Willie Mae”, an ode to Big Mama Thorton. By this point if Dede’s voice hasn’t drawn you in, I suggest you seek medical help pronto. Dede’s captivatingly toned guitar and yearning vocal carry the slow burning blues of “What It Is Ain’t What It Ain’t”. It clocks in as the longest song here at 7:23 minutes. They can handle a country-ish upbeat song like “Strawberry Party” with just as much skill and ease as the more rocking tunes here. Her violin adds just the right touch. Acoustic and a ringing electric guitar are the sole instrumentation backing Dede’s magically hypnotizing voice on the haunting “Snowy Mountain”. Johnny Clark adds an underscoring vocal to “Won’t Last Long” as Dede once again burns up the guitar strings. Johnny Clark handles lead guitar duties on “Wanda”, as Dede sticks to her trusty violin. I detect a tad more soulful twang in her amazing voice on this one. Sinewy violin lines cut through a nasty distorted guitar riff on the powerful “Lynched At The Crossroads”. Johnny comes on board for his only vocal with his throaty voice as Dede echoes his words in the background on “Alaska”. The title tune is a wah-wah charged force of nature. Dede’s guitar carries a really nice Texas blues shuffle with “Helen’s Backyard”. The rhythm section of Ray Oostenrijk on bass and Leon Toonen on drums propel this one just as they do on the remainder of the album. Their cover of Luther “Snake Boy” Johnson’s “Mister Don’t Lie” is enhanced by a tricky and seductive guitar riff. This band is simply amazing. The energy they deliver with just four musicians is beyond what words can describe. I guess you gathered by now that I consider Dede’s vocal powers to be coming from a magically soulful alternate universe. I just can’t say enough. The recording, mixing and mastering by Erik Spanjers pulls it all together. You truly owe it to yourself to pick this one up. Play it loud!